The fundamental physics of particles adsorbed at the liquid interfaces has numerous applications in a wide field. 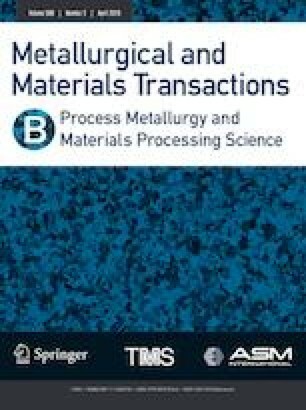 In the current study, the motion and detachment behaviors of the liquid nonmetallic inclusion from molten steel–slag interfaces were theoretically studied by developing a force balance model. According to the model calculations, the thin-film drainage is the main stage of the inclusion separation. The capillary force is the main driving force of the inclusion rebounding at the drainage stage. The effect of triple interface among the steel, slag, and inclusion after the film rupture does not seem to be the main factor for the inclusion detachment. The current model can predict the critical inclusion size of the detachment. The vertical terminal velocities of the inclusion, inclusion size, and slag surface tension are the key factors of the detachment. Our co-author Dr. Mselly Nzotta is deceased. We would like to appreciate his contribution to the current study and remember him forever. Manuscript submitted November 19, 2018. The authors would like to acknowledge Uddeholms AB for the technical support. K.J. Malmberg, H. Shibata, S.Y. Kitamura, P.G. Jönsson, S. Nabeshima, and Y. Kishimoto: J. Mater. Sci., 2010, vol. 45, pp. 2157–64. https://doi.org/10.1007/s10853-009-3982-x. C. Xuan, A.V. Karasev, P.G. Jönsson, and K. Nakajima: Steel Res. Int., 2016, vol. 88, https://doi.org/10.1002/srin.201600090.